“Scholes’ pioneering work helped establish new norms for thinking about the financial markets that continue to dominate investment decisions today,” said Jeff Silk, USF alumnus and founder of the Silk Series. Widely recognized as a pioneer of derivatives pricing, Scholes will kick off the School of Management’s 2017-18 Silk Speaker Series with “A (R)evolution in Asset Management,” a discussion on the changing landscape in the financial markets. The Silk Series brings renowned leaders to the University of San Francisco to provide insight on business, finance and global issues. Called a “rock star of economic theory,” Scholes is the co-recipient of the 1997 Nobel Memorial Prize in Economic Sciences along with Robert C. Merton. Scholes helped create a system to manage financial risk across investments and in the individual valuation of companies. The Black-Scholes method, a conceptual framework for determining the value of derivatives, is the de facto standard for pricing options and derivatives today. Scholes is the Frank E. Buck professor of finance, emeritus, at the Stanford University Graduate School of Business. He has consulted widely with financial institutions, corporations and exchanges and has served as an advisor to the Guangdong Provincial Government. The Aug. 30 event will start at 5:30 p.m. with a 30-minute reception, which will be followed by a lecture and question and answer period. 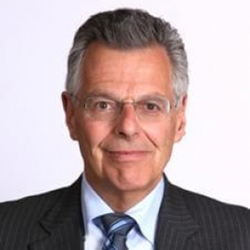 USF School of Management Finance Professor Ludwig Chincarini will moderate. Funded by a transformational gift to the University of San Francisco by investment expert Jeff Silk ’87 and his wife Naomi, the USF Silk Speaker Series brings international thought leaders in business, finance and global issues to USF campus. Now in its second season, previous Silk speakers include Steve Wozniak, co-founder of Apple, Inc., Dr. Condoleezza Rice, 66th Secretary of State, and Dr. Robert C. Merton, Scholes’s co-Nobel Laureate in Economic Sciences. Learn more about the Jeff & Naomi Silk Speaker Series at http://www.usfca.edu/news/Silk-Speaker-Series. The University of San Francisco is located in the heart of one of the world’s most innovative and diverse cities and is home to a vibrant academic community of students and faculty who achieve excellence in their fields. Its diverse student body enjoys direct access to faculty, small classes, and outstanding opportunities in the city itself. USF is San Francisco’s first university, and its Jesuit Catholic mission helps ignite a student’s passion for social justice and a desire to “Change the World from Here.” For more information, please visit usfca.edu.